My favourite cookie flavour has always been oatmeal, cinnamon and raisin. I just don't tire of them, especially the amazing smell they leave in the kitchen after I've baked a fresh batch. 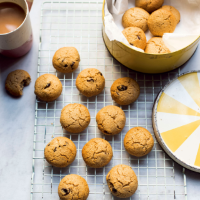 I've tried and tested lots of different ways to 'healthify' the classic cookie, which is packed full of refined sugar, and I've finallu perfected my recipe. 1. Whisk together the oats, flour, baking powder, cinnamon and salt in a large mixing bowl. 2. Place the coconut oil and almond butter in a microwaveable bowl and microwave for 20 seconds until the coconut oil melts. Stir in the honey or agave nectar and the vanilla extract, and mix until combined. 3. Pour the coconut oil mixture over the dry ingredients, add the egg and stir well. Fold in the raisins. 4. Cover and refrigerate the cookie dough for 20-30 minutes to allow the mixture to stiffen. 5. Preheat the oven to 180°C/350°F/gas mark 4 and line 2 flat baking trays with greaseproof paper. 6. Using a tablespoon, scoop out 12-14 portions of the cookie dough onto the trays. Flatten down each slightly. Bake for 10 minutes and let them cool on the trays for 10 minutes before transferring them to a wire rack.